My boat was built in 1975 and, if my watch is right, it’s now 2009. I love my boat. They don’t make boats like this anymore, and if they did she would cost a fortune. So what does a poor guy do with an old boat? Some buy new ones. But if you’re among the unwashed common folk like me, that’s out of the question. 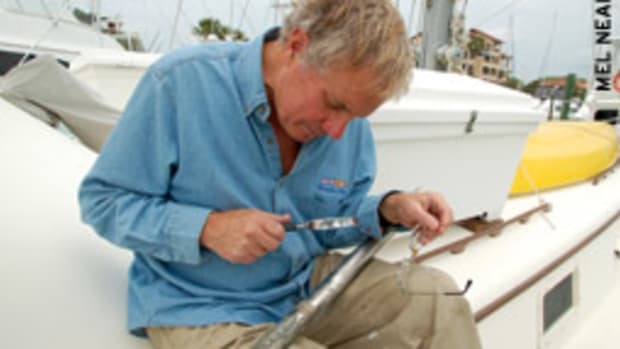 Some propose an exhaustive project of rebuilding your old boat. That can be a great idea, but it normally will also be very expensive and time consuming. If you have the skills, knowledge and energy to do it yourself, it may be less expensive in dollars, but it’ll still be very costly in the time it takes. And your boat will be out of use for a long time. I’ve seen many instances where people undertake a rebuild project and by the time it’s complete they’re so tired, old and/or broke they give up and sell the boat, having never gotten a chance to enjoy her. So let’s get real about all this. There’s another alternative. I haven’t scrapped my boat or “rebuilt” her from scratch, but I’ve “newed her up” through the years. “Newing up” a boat means gradually, within the confines of your budget and time, making improvements that begin to make you feel like you’re getting, one step at a time, a new boat — or at least a newer boat. The improvements should be things that are both practical (to justify what they cost in time and bucks) and make you feel better about being on your boat. The new feeling is very important to your psyche. The things you do can range from big items to small items that may cost little or nothing. Some you can do yourself, not as an overwhelming and exhausting marathon but during a little bit of pleasantly spent, fulfilling time. Since we acquired our present Chez Nous, we’ve been constantly newing her up. Today she’s amazingly different from the first day we came aboard. In many respects she’s like a new boat. Here are just a few examples of things we’ve done to Chez Nous recently. Perhaps they’ll give you some ideas. We did a large project in the summer, and the result was like the difference between night and day on board — a much greater difference than you might expect from the cost and time involved. We replaced all 16 of her portholes. Why? Well, besides the fact that Mel wanted this job done (insisted), there were a few other reasons. They leaked, except for the ones I had permanently sealed. We couldn’t see through many of them unless we opened them. We couldn’t open half of them because we had permanently sealed them to keep them from leaking, and we were afraid to open the other half because we knew they’d never stop leaking once we did. Three leaked even though I’d sealed them with 3M 5200 — the one over my computer station, the one over the nav station, and the one over our bed. We couldn’t see through them because of all the crazing in the plastic window part. Our boat had various owners before us and I don’t even know all the places she’s been. 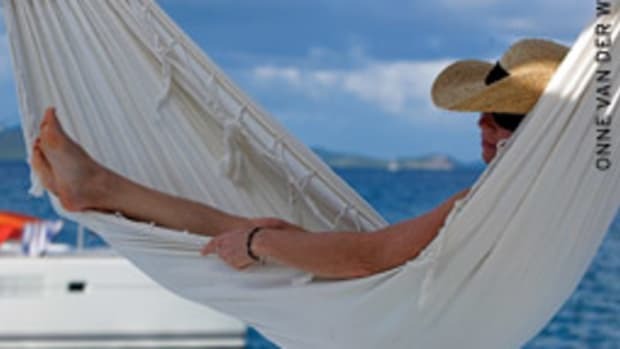 I do know she spent much of her life in areas of very high UV exposure, such as the Caribbean, the Bahamas and South Florida. I also know that she’d experienced many storms at sea, some under my watch. For any one plastic porthole to last all that time through all that use is not far short of miraculous. Finding portholes that match the porthole cutouts on a boat that’s 30-plus years old is a bit of a challenge. We couldn’t find an exact match, but we found one close enough so that only a little fiberglass grinding was necessary to make them fit. We got them from Bowmar, a division of Pompanette (www.pompanette.com). Bob Touton, product manager for hatches and portlights, is a very knowledgeable and helpful guy. He helped us find what would work, matching his current models with our prehistoric relics. We wanted to get stainless ports but had to settle for plastic (like the originals) because, as is so often true with boats, we couldn’t afford what we really wanted. And if these plastic ones last half as long as the original ones — and they look like they’ll last much longer — we’ll be more than happy. Bob’s helpfulness went far beyond helping us find a product that would work. He helped us in the very worst part of the project: the installation. He could do this because he not only sells portholes and many other things for his company, he has actually installed quite a few. 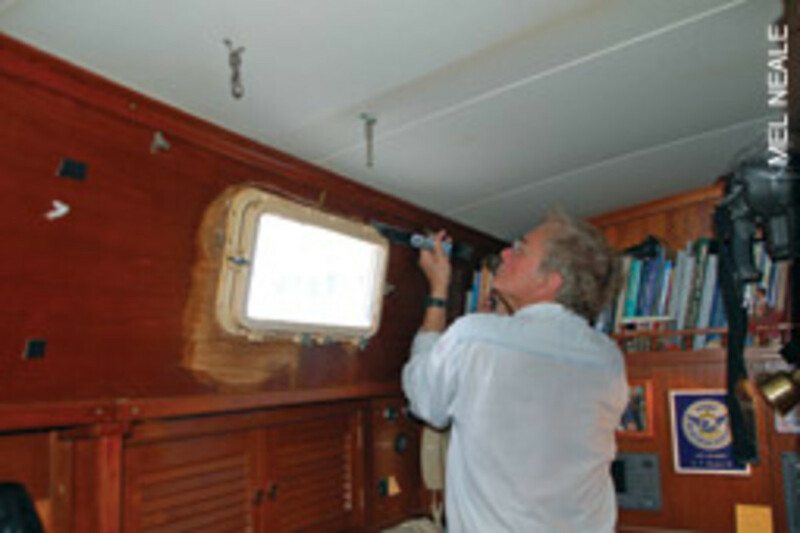 He knows the awful, ugly truth about porthole jobs: Putting new portholes in is nothing compared to taking the old ones out. Especially if the ?*#&! who put them in used 3M 5200. On our boat, this stuff had been used with wild abandon by some “craftsman” down in the Caribbean who, I’ve been told, had replaced many of them long ago. There’s nothing forever in this universe except death, taxes, 3M 5200 and the fact that boats break and will need repair until they sink. That Caribbean caulking freak obviously never thought of this. 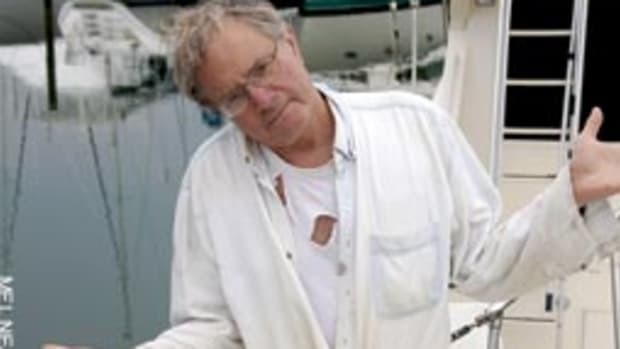 Bob gave us numerous jewels of advice, the most important of which was to celebrate each time you got an old porthole out. Also, we had Dave Peresluha, a local experienced marine craftsman, to do the skilled work such as fitting and cutting. Unless the portholes are exactly like the ones you’re replacing, shaping the new holes can be a disaster if you don’t know what you’re doing, and his expertise and hard work were very helpful. The first step in removing the old portholes was to remove the outside finishing rings. These had been screwed and glued to the hull with 5200. I’ve used quality box cutters to cut 5200, but you have to be able to get the razor blade (or any other product, such as solvents) to the 5200 you want to cut. After numerous futile experiments, we solved the problem with the oldest, most reliable set of tools I have: a steel maul and a pry bar. I hammered the bar under any spot I could find where there was a little space between the ring and the hull and then hammered the wedge along the ring until it started pulling loose. Next, with a razor in a heavy-duty box cutter, we slit the 5200 between the old porthole and the hull as much as possible. This was difficult and dangerous because of the pressure you need to use on the razor. After that we moved inside for more fun with the maul and pry bar. The old portholes had integral flanges that were supposed to be screwed or bolted into or through the hull. But the installers had glued them to the teak veneer that lines the interior cabin walls — using, of course, 5200. They should have been secured to the hull. There was no way we could cut or pry the portholes loose from this thin teak veneer. We knew we would have to replace it all. We cut away the teak around the portholes with an oscillating saw and slowly hammered the pry bar around each flange, tortuously breaking the grip of the 5200 an inch or so at a time. As one person did this, another was outside with the box cutter, severing the 5200 tendrils still mightily trying to hold the thing in place. Dave suggested we use Komatex to replace the old sheets of teak veneered plywood. It was a great idea. This material (described as PVC foam sheets) won’t rot, provides some insulation and is light and easy to work with. The white Komatex created an entirely new aura inside Chez Nous. 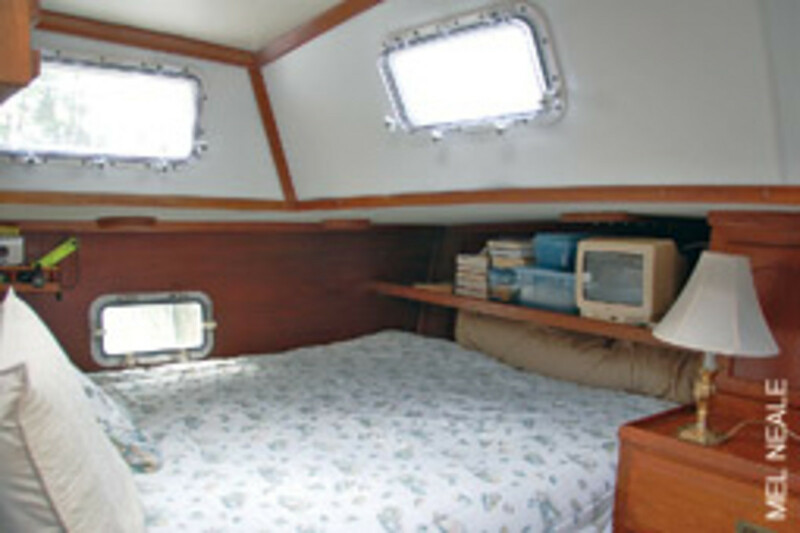 Instead of the bat cave feel so common on older boats, she now feels light, open and airy inside. And, of course, with new portholes that aren’t fogged over by age and that actually open, it’s like we have an entirely different boat. The holes in the hull had to be ground back slightly in some areas to fit the new portholes, and the cuts for the drain spouts had to be ground, but this was relatively easy with the oscillating saw and a grinder. We used fast curing 3M 4000 to seal the new ports to the hull, not the Komatex. We also screwed and through-bolted them to the hull, in addition to gluing them. The accompanying “before and after” photos speak for themselves as to the transformation from an old to a new boat. 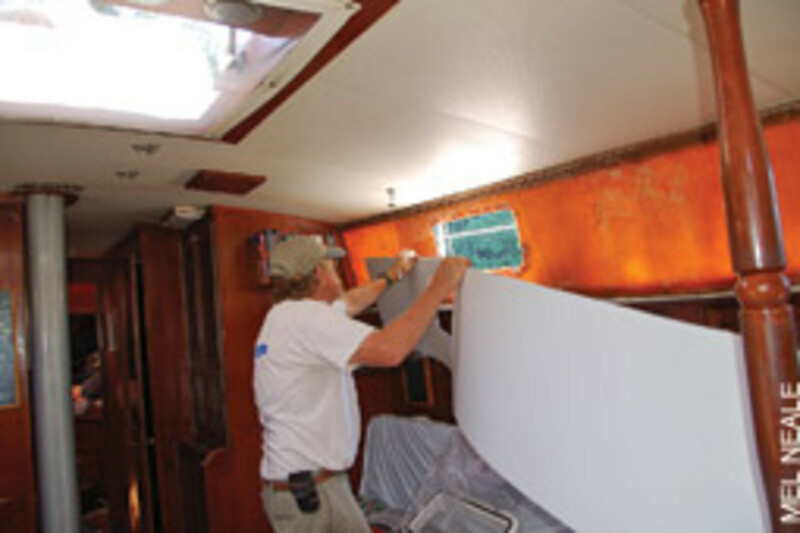 Many boats have cockpit enclosures with a Bimini-type top made from Sunbrella or Stamoid and windows in the front and perhaps sides made from clear vinyl such as Strataglass, which has a special coating for UV protection. The cockpit of our motorsailer is completely enclosed so we essentially have a totally weather-protected wheelhouse with 360-degree visibility, though we can roll up the sides for an open steering station. Through the years these “windows” become less and less see-through because of dirt, yellowing and general deterioration. Using quality material when these are installed will greatly lessen and delay this problem, but ultimately you’re going to be getting that old-boat feeling as you try to peer through. On Chez Nous, we quickly get a new-boat feel inexpensively with a little work and TLC. When the windows begin to get cloudy we begin the project. We first wash the top with a long-handled soft brush using an appropriate boat soap. (We use the Sea Safe Boat Wash by Star brite or Interlux All-Purpose Boat Soap.) In places we can reach we use a soft cotton towel. This has nothing to do with visibility, but if you neglect the top you’ll find that bird droppings and other dirt will rot the threads holding together the fabric panels. It’s best to take care of this first before turning to the windows. (It’s also a good idea to do this more frequently than the window job.) Then we turn to the visibility issue. We spray the windows inside and out with fresh, clean water to get all grit and grime off. Using a water filter, such as the Wet Spot soft water washdown system (www.softwetspot.com), is particularly helpful if the water on your dock leaves spots. (The spots are indicative of impurities that can scratch and leave residue on the soft windows.) Next, we thoroughly but carefully wash the windows with soap and water using a soft, clean cotton towel. “Soft” and “clean” are important concepts here to avoid scratching the material. Then we dry the windows inside and out with additional soft, clean cotton towels. We then spray them inside and out with Plexus. This gives a degree of UV protection and acts as a cleaner. Finally, we wipe and slightly polish the surfaces with another soft, clean cotton towel. This process can make the windows look almost new, unless they are too far deteriorated by age, UV and wear. We also apply Star brite White Teflon Snap and Zipper Lubricant to the zippers and metal fasteners. This not only helps the zippers slide easier but helps to protect them from UV deterioration, which will often ruin a good enclosure before anything else. You’ll be amazed at how much newer your boat will seem with this simple project. The folks at Sailrite (www.sailrite.com) recommend and sell products by Imar created expressly for cleaning and protecting both Strataglass and Stamoid. We have not tried these products yet but probably will soon, in the interest of prolonging the “newness” of that expensive cockpit enclosure. From fresh air and wonderful views, we now move farther below to air you don’t want to even think about and views you never want to see. However, correcting this problem is one of the things you can do to for that new-boat feeling. I’m referring, of course, to clearing out the inner recesses of your head system. If you’re one of the blessed who don’t have an old boat or one of the Olympians who have had enough sense to stick with boats that don’t have heads, you probably don’t have a clue about this issue. The rest of us do. As you use your head, a calcium-like scale builds up on the insides of the system, including head components, vented loop, anti-siphon valve, Y-valves and the interior hose walls. It happens in salt as well as fresh water, the nature and exact constitution of the buildup varying with what’s in the ambient water. Unbeknownst to the uninformed flusher, the passageways inside the system become smaller and smaller. It isn’t unusual for the 1.5-inch internal diameter of a typical MSD hose to become not much more than a half-inch. This happens very slowly, and, at first, one doesn’t even realize it’s happening as it becomes harder and harder to achieve a flush. So insidious is the creeping nature of this menace that often a boater won’t realize what’s been happening until a failure occurs, which could range from a burnt-up pump (or carpal tunnel syndrome if you’re a manual flusher) to, best of all, a sudden blockage with the resultant sudden (sometimes explosive) infusion of you-know-what into your vessel’s bathroom or some impossible-to-reach hole behind the paneling. 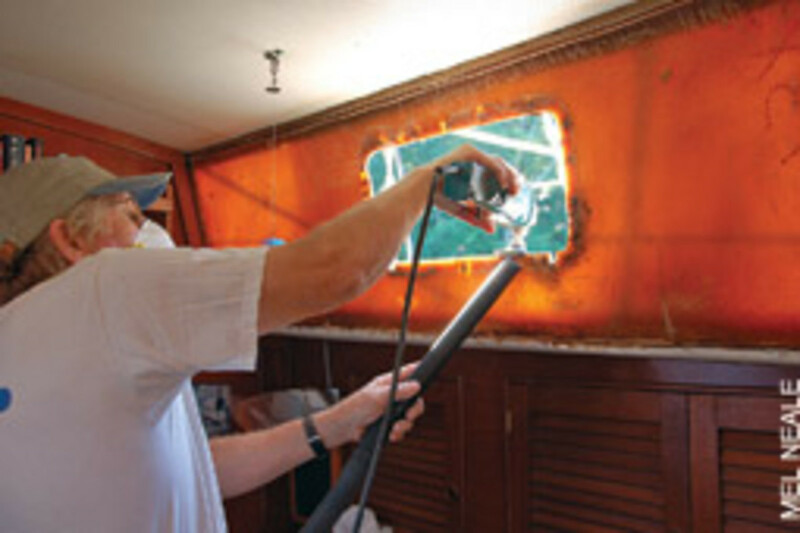 In the past, the solutions to this aging boat problem have included regularly flushing vinegar down the head, occasionally pouring a solution of muriatic acid and water down, regular removal of head hoses and flogging them against a piling until all the scale flies out all over the dock and nearby boats, regular disassembly of the head and related components, and complete replacement of hoses and even heads at regular intervals. (I can replace the entire pumping assembly on my manual Raritan PH II in around 30 minutes.) Some of these steps are very expensive, some are dangerous, some are environmentally unfriendly, and all are both odious and unpleasant. Raritan to the rescue. Raritan Engineering (www.raritaneng.com) has been making marine products for more than 50 years, from icemakers and water heaters to holding tanks and heads, including the Lectra/San and Electro Scan (demonstrably the most effective and environmentally friendly solution for black water treatment in larger boats). Dale Weatherstone, managing director of Florida operations for Raritan, recently told me that the company has come out with a new product to effectively deal with the problem of calcium-like buildup in head hoses. He explained that the product was the result of much research because it not only had to get rid of the incredibly tenacious crud, but had to be harmless to components such as hoses, valves, plastics, metals and the electrodes on the Lectra/San and Electro Scan. And, needless to say, it had to be environmentally friendly. Skeptically, I got a bottle and used it on my boat. All I can say is that it works incredibly well, and I feel like I have a new boat in the head department. And that’s a very important department. The product is called CH (for “cleans hoses”). It isn’t cheap, but it’s a lot cheaper than a new boat — or even new hoses. We’ve been talking about very noticeable creature comforts and feel-good items. Let’s turn to something you may never think of until it’s developed into a disabling issue. As boats with inboards get old, the running gear can substantially degrade. You won’t see it unless you’re carefully looking while the boat is out of the water, but you may begin to feel it. As the cutless bearing wears there’ll be a little vibration and perhaps even some shaft whip. As the shaft spins in the cutless bearing and inside the shaft seal, it also wears over time. The wear may be so slight that it’s difficult to see (though you can usually feel it), but it causes gradually increasing movement and can eventually weaken the shaft. 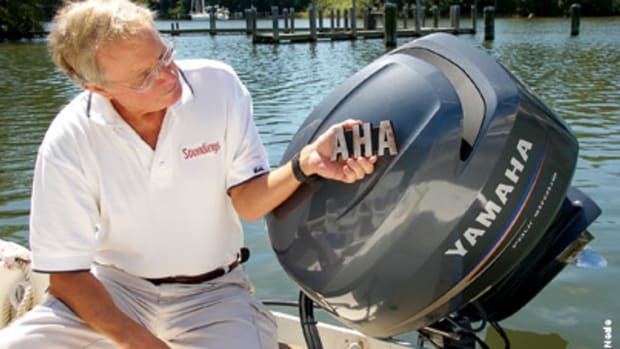 In the overall scheme of boat work, it’s relatively inexpensive and easy for a competent yard to replace the cutless bearing, as well as the shaft if it’s worn. The bearing shouldn’t be very expensive. The shaft will be more so, but a weak shaft not only causes rough running but can break and leave you stranded or sinking. The labor for shaft and cutless bearing replacement should not be excessive, especially if the yard has the proper equipment — for example, a hydraulic cutless bearing remover. This is also a good time to have your prop sent to a prop shop. You don’t have to hit a log for the blades to wear and become slightly out of true over the years. 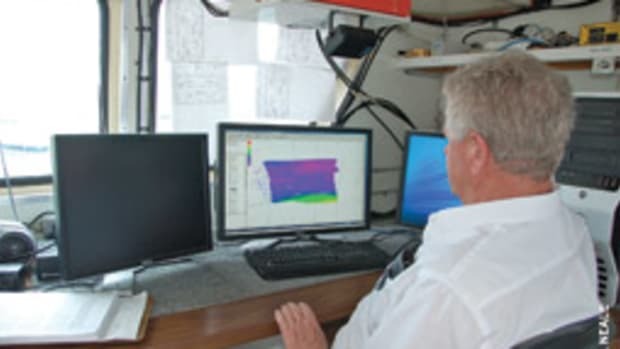 After this work, you’ll want an engine alignment, not only because of the new gear and tolerances but because it isn’t unusual for daily usage and the gradual settling and working of a boat to affect alignment as years pass. An engine alignment can be time-consuming, but a poorly aligned engine causes vibration, rough running and shaft whip (which can break a shaft), and can damage your transmission. 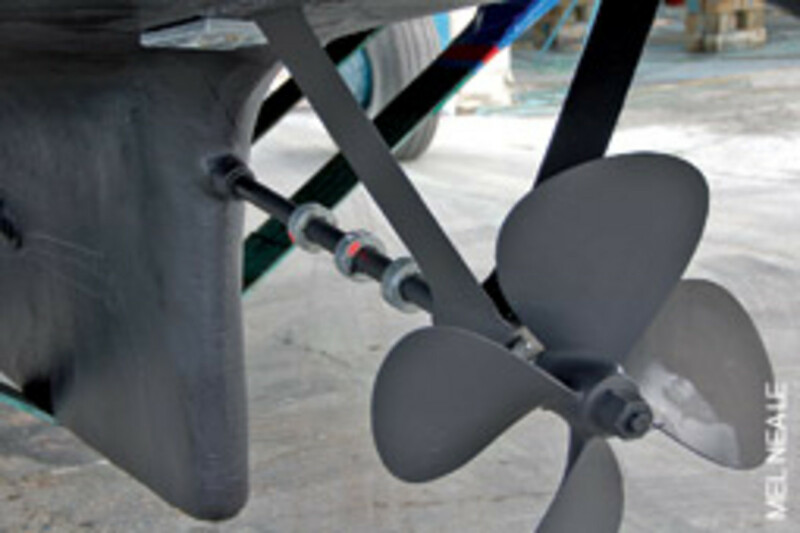 These projects can make your boat run smoother and with less vibration and noise, may add a little speed, and will strengthen this critical part of the system, giving you new-boat peace of mind. We’ve recently been doing some “newing up” projects on our 1985 Mako center console. One of its cosmetic problems is that, through the years, there have been so many instruments and gadgets added and removed and changed on the console that the once nice white platform is full of patched holes and scars. We could spend days sanding and painting this surface, but we’re going to opt for another cure. We plan to use Komatex, which we became familiar with during the porthole job. This material is easy to cut, flexible, and will hold screws if the material is thick enough, though I wouldn’t screw heavy items to Komatex. With a little skill and some careful measuring, you can cut a sheet to fit over your old, scarred steering/instrument area, screw it and/or glue it and, voila, you’ve got a looks-like-new instrument panel. You could also use Starboard, which is more rigid. I generally use it for more structural applications. Starboard comes in various thicknesses, and the thin material is relatively flexible. This was used on our Mako when the throttle/shift control had to be moved from the original cutout to another. It looks good and is more than strong enough. On Chez Nous, we used black Starboard to cover the holes left when we replaced three old instruments with new ones that didn’t fit in the old holes. The Starboard makes that area look newer and has ample strength for the application. Both of these materials are quite easy to cut, form, trim and work with, although I’ve found Komatex to be the easier of the two. They also can be used to cover and clean up other bruised and scarred areas of the boat. If your older boat has beds or bunks, the mattresses probably have a big dent in the middle and are exceptionally uncomfortable. Marine mattress companies may charge a lot of money and tell you that the mattress must be specially “cut and contoured.” We recently went to a Walmart and bought a foam mattress that included a thick layer of “memory foam.” We cut it ourselves with a serrated kitchen knife using the old mattress as a pattern. It cost about a quarter of the quotes we had received from marine shops. Our bed now feels and sleeps like a new-boat bed. Any boat, except for the simplest skiff, will have some wiring — even if it’s only to get juice to the running lights. Old wiring on old boats is a major source of aggravation, creating problems ranging from lights that don’t work to motors that don’t start to fires. Ideally, replacing all the wiring and related components is the right thing to do to renew an old boat. But for most of us, doing the entire job at once would take more time and money than we have available. Typically when something happens, like a running light quitting, the tendency is to squirt corrosion preventative lubricant into the hole, jiggle the wires, pop in another bulb and, if it lights, forget about it until the next time. But if you take that opportunity to replace the base and its wiring and terminals, that small part of the boat will be new. If your boat is very old, you’ll find that modern wire (now tinned, for example), insulation, terminals and many other aspects of the material are much improved. Use material that’s made and approved for the marine environment. It lasts longer and is safer and, through the years, you’ll be glad you did. When you replace that wire to the running light, you can use the old one to pull the new one through, and then label the new one so you’ll know what it is in the future. While doing this job, you may discover other problems waiting to happen. Be sure you remove all sources of electricity before working, including inverters and batteries. Anything involving electricity and wiring on a boat can be dangerous to the person doing the work and dangerous in the future. Requirements as to methods and material for boat wiring and electrical components are very different than those for household wiring and electrical components. It must be done correctly according to established standards to avoid serious, even dangerous, problems. If you have the knowledge and skill and take wiring projects one step at a time, as problems manifest, you may have an easier learning curve. Don’t hesitate to get qualified professional help this if there is any question as to your skill and knowledge. These are but a few of the many projects that will make your boat look, feel and act newer without a federal bailout and without consuming your boating season. The lists of things we’ve done since we got Chez Nous would fill a book. Other projects may be more appropriate to your boat and your abilities. But whatever they are, they’ll increase the value of your investment and improve your enjoyment. You and your boat are worth the effort.